You won't believe how easy it is to make these cute little penguin buddies! Crush the chocolate biscuits inside the packet, then carefully open one end and stand them up inside a glass, and pour in cream to fill each one. Add an ice-cream stick to each and place in the freezer for 1 hour or until frozen solid. Remove the packaging and dip the ice cream into melted white chocolate, covering the entire thing. Then dip each side into melted dark chocolate to leave a triangle of the white chocolate showing in the middle. Add 2 orange Smarties® for feet, using the melted chocolate to stick them on if necessary. Then add an orange Mini Smartie® for the beak. Use a toothpick dipped in white chocolate and then dark chocolate to make the eyes. 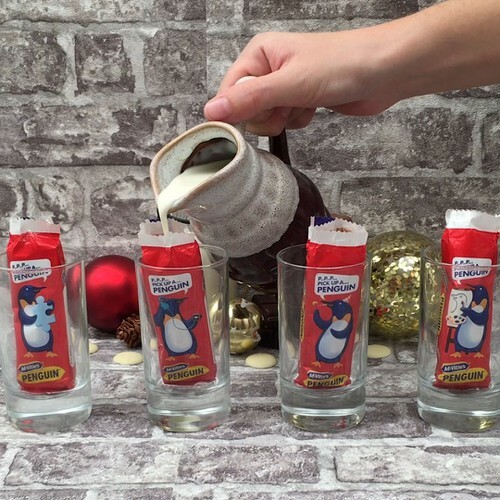 Enjoy you little penguins straight away!